Eeek!! 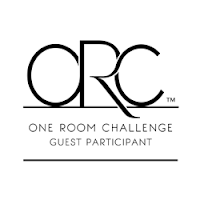 It's already week 5 of the One Room Challenge hosted by Linda of Calling It Home Blog, and let me tell ya...I'm a little frantic! Although I accomplished some major progress over the past week, there is still much to be done. 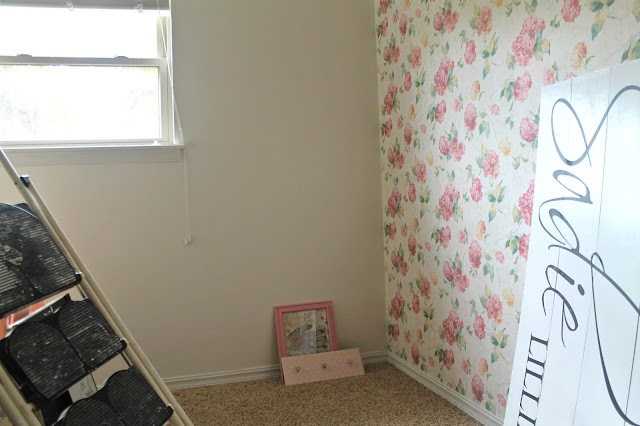 If you're not familiar with the One Room Challenge, it's a challenge where we take on the task of completing a room makeover in just six short weeks. I am participating as a guest participant. To see previous weeks progress click links below. One of the biggest things we (my husband and I) completed over the past week was putting up the wallpaper! Here is a sneak peek of the wall...as you can see I still have a ton of decorating to do. But is this wallpaper gorgeous or what?!? It's from D. Marie Interiors and I am obsessed! It was pre-pasted making put up super easy. To see more pattern options check out their Instagram page. For this print click HERE. On the wall I put the wallpaper on, I had vinyl letters in Sadie's name. I didn't want to trash them so I came up with a solution to save them. I took our leftover shiplap boards that we used in our bathroom makeover, painted, and glued them together. I transferred the letters onto the board and I think it came out pretty awesome! I haven't decided which wall I will put it on yet though. I love these peonies, hydrangeas, and roses in this mercury glass vase from Lamps Plus! It may or may not stay here but I'm loving it for now. 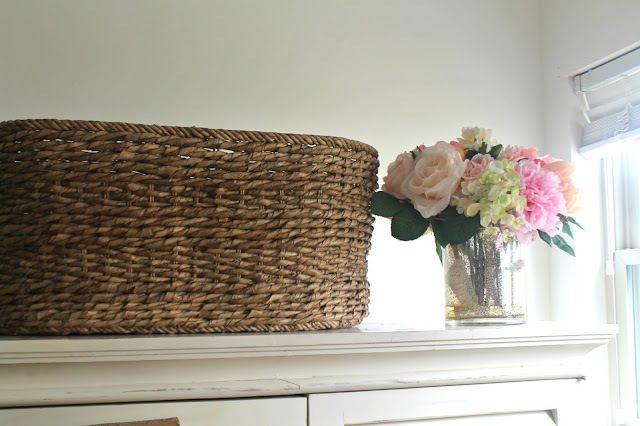 I found this oversized basket from Marshalls over the weekend and I plan on using it for blanket storage, because you know it's hard to get rid of all those baby blankets and quilts. The overall room is still in dismay at the moment but I will be working all weekend to finish it and I am pretty confident I can finish it. Ok, so here is all I need to get done over the next few days..
That's not much right?!? Sheesh! Thanks for stopping by and be sure to come back next Thursday to see the final reveal!! I cannot wait for this. Also, be sure to head to the link up at Calling It Home to see all the other bloggers week 5 progress! A special thanks to my amazing sponsors! Ok, the wallpaper is stunning! And I love how you re-purposed the vinyl and ship lap. Cannot wait to see the final reveal!